Currently living in Wrocław developing a research project with local theatre company Teatr Piesn Kozła. Wrocław is a beautiful small city, full of culture and life. Its city slogan is “the meeting place” and in my time here I have come across many artists from Europe and beyond who are attracted to the rich strand of theatre found here. As I write the city is blossoming into Spring and the Euro Cup 2012 approaches, this year hosted by Poland. On any given day most people you pass on the street will be eating ice cream and when it reaches 30 degrees you will see many red faces soaking up the much-waited-for sun. I first came to Wrocław to train with local theatre company Teatr Piesn Kozła (Song of the Goat Theatre) in their MA Acting program facilitated by Manchester Metropolitan University, UK. Piesn Kozła is a highly acclaimed avant-garde theatre company working in the tradition of ensemble laboratory theatre. In the artistic lineage of Polish theatre directors Jerzy Grotowski and Włodzimierz Staniewski (Centre for Theatre Practices “Gardzienice”) the company develops performances over a long period of time, researching, training and presenting new theatrical works with a consistent ensemble of actors. This company attracts artists from around the world to experience their unique approach to actor training through their workshop and MA programs. Every July, Piesn Kozła hosts the Brave Festival, an international festival of disappearing cultures. This event brings together performances from around the world that are living examples of ancient cultural traditions. With an emphasis on music and song the festival aims to celebrate precious cultural practices that may be under threat due to the pressures of modern society. The theme of the 2012 festival is Women’s Voices and will take place July 2-7. Wrocław is also home to The Grotowski Institute, an organisation dedicated to the work of Jerzy Grotowski, whose laboratory theatre was based in Wroclaw 1965-1984. Located in the Rynek (town square) this centre holds archival material of Grotoswki’s work as well as collections from associated artists such as Peter Brook and Eugenio Barba and his Norwegian/Danish company Odin Teatret. The institute is also very active in hosting theatrical research projects, workshops, lectures, film screenings, festivals and performances. Last year I was lucky enough to see Eugenio Barba, dressed in sandals in the cool Polish autumn, introducing one of Odin Teatret performances being hosted there. Currently the institute is running a research project with acclaimed Russian director Anatoly Vasiliev; such projects are attracting artists from all over Europe to audition and participate in laboratory theatre programs. Biennially the Teatr Wspolczesny in Wrocław hosts the Dialog Festival, showcasing high profile artists from around the world. Dialog is usually held in October with the 2011 event featuring work by Polish director Krystian Lupa, Les Ballets C de la B (Belgium), Sociétas Rafaello Sanzio (Italy) and Teatro Milagros (Chile) to name a few. Definitely worth a look if you are visiting the country in 2013! 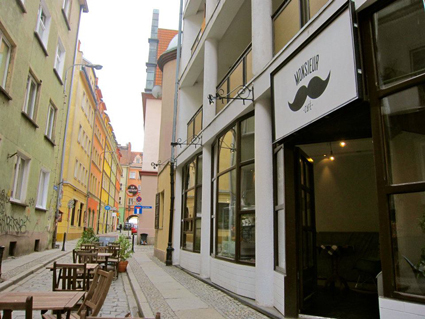 There are many little cafes and bars growing like mushrooms all over Wrocław, but I would recommend the lovely Monsieur Café. Located just off the Rynek, this romantically French style café serves delicious home made cakes and croissants and is a very nice place for writing postcards or using the free Wifi. Another favourite haunt is the beautiful Mleczrnia Café located on ul. Pawła Włodkowica. With its chic antique décor and candle-lit tables it is a must stop for a delicious Polish hot chocolate, giant cappuccino or a sumptuous breakfast. Mleczrnia also doubles as a hostel and offers lovely accommodation at relatively affordable prices. If you want to boogie until the Polish sun rises, I would recommend the gorgeous art deco bar Kalumbur located on ul. Kuznicza—a great place to sample some Polish vodka and if you are lucky you can be out-danced by a particularly crazy DJ. If you’re staying in town for a few days I would definitely recommend hiring one of the city bikes or taking a stroll. The Odra River weaves through the city and not too far from the town centre you can find the islands of churches, old style buildings and the botanic gardens. 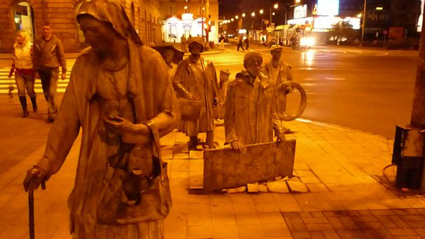 As a student town, Wrocław is home to a lot of young people, many of whom speak English. So it is quite possible to get by as an English-speaking tourist, but it is always appreciated if you make the effort to speak some Polish too! Janie Gibson is an actor and theatre maker. 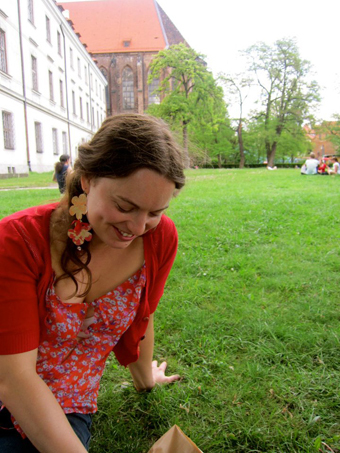 She has trained at UNSW, PACT Theatre, Teatr Piesn Kozla (PL) and most recently Shakespeare & Company (USA). Her work focuses on the ensemble as the heart of the theatrical process and an understanding of theatre as an ongoing practice of research. She is currently exploring the art of oral tradition in the performance of drama, storytelling and song. Recent productions include Stories of Love and Hate with Urban Theatre Projects and Sydney Theatre Company and Rhapsody by her own company Whale Chorus, part of Underbelly Arts Festival 2011.